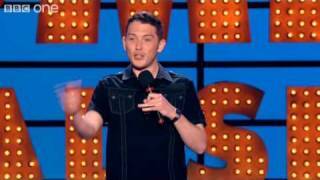 Jon Richardson began stand-up in May 2003, and within his first year reached the finals of the J20-sponsored Last Laugh competition. He established himself on the circuit, and in 2006 supported Alan Carr on his 60-date tour. His debut Edinburgh show, Spatula Pad, was nominated for the if.comedy award for best newcomer at the 2007 Fringe; and in 2008 he won the Chortle Award for best breakthrough act. The following year he was nominated for the main Edinburgh Comedy Award. He is best known as team captain on Channel 4’s 8 Out Of 10 Cats, for which he was nominated for best male TV comedian in the 2013 British Comedy Awards. His other TV credits have included Have I Got News For You, Live At The Apollo and Michael McIntyre’s Comedy Roadshow. He also hosted a Sunday morning show on BBC 6 Music, having originally been Russell Howard's sidekick in the same slot. Sorry. We have no listings of forthcoming performances by Jon Richardson. We do not currently hold contact details for Jon Richardson's agent. If you are a comic or agent wanting your details to appear on Chortle, click here.